I am trying to figure out all kinds of new things in the digital realm, and I took my eye off the blog-ball for a while as I learned about Twitter. Part of being Old, Strong, and Fast is that you are, first, Old. Which means that you are not a digital native. I grew up in the world of print, and blogs (almost) make sense in that way. They’re like essays. Social media platforms don’t make sense that way, at least not to me. I refuse to be involved in Facebook (and that refusal predates their data security issues). So Twitter was the natural go-to. It’s taken me some time to get the hang of it, and I’m still not sure how to make it work in the service of an audience for the blog. But I do get the ease of it, and the power of it. 1. Hit a new squat PR: 315. Welcome to the 3-plate club! 2. Worked through a cycle with a test week at the end: 315 squat, 225 bench, 375 deadlift. 915 total. Not bad for an interim, off-season cycle at 165 lbs., and 62 years of age. 3. Worked through the cycle with track workouts interspersed; ran my own periodization on those. 4. Missed the outdoor track season entirely: had a decathlon cancelled on me because too few signed up. Let some other opportunities go because I was peaking for the deca. 5. Traveled to Italy for two weeks, where I managed to eat a lot without gaining weight. 6. Had a scare with my right meniscus; to be honest, that one may turn out to be more than a scare—we’ll know in a few weeks as I begin to squat again under more weight. I’m sure there’s a tear, but don’t know if I can work around it. 7. Signed up for a USAPL coaching certification course. And I have to decide (or let my knee decide) if I’m doing Raw Nationals, Bench Nationals, or no nationals. That’s what I have done. What have I learned? I have learned that changing coaches, and the resulting change in programming, can be a very good thing. For instance, my current coach benches every session, which means not that I’m getting stronger, but that my technique is getting better and better. Of the three lifts, bench press is the one I did longest with bad form. I have a lot to overcome. I have learned that missing a couple of sessions mid-cycle can have bad effects at the end of the cycle, even if you have been hitting your numbers. Last cycle I was ill one Monday (deadlift day) and out for work one Monday. I am sure that is the reason that, as I hit my bench number on test week and obliterated my squat number, I could not pull my deadlift number. Yes, it would have been a gym PR, but the point is that my programming was set up to get there. I didn’t do the entire program. I didn’t get there. 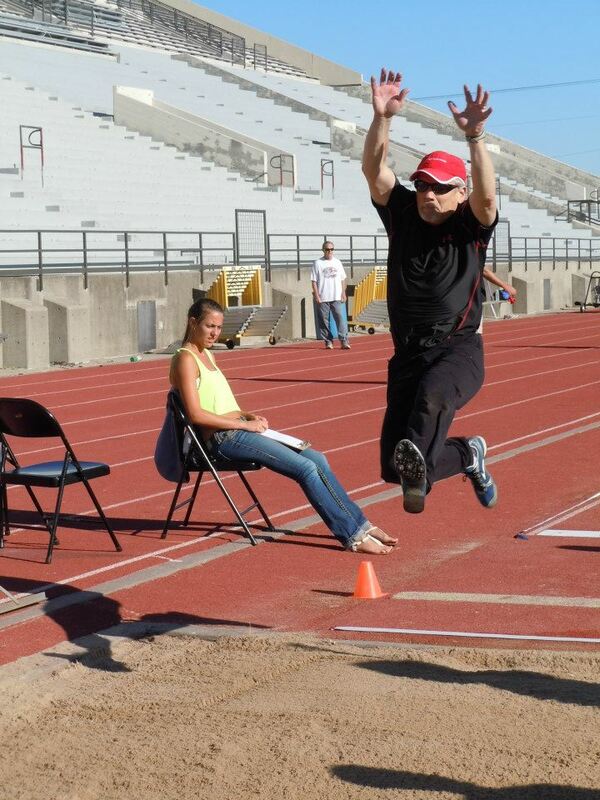 I have learned that peaking for decathlon/pentathlon will require even more adjustment than I did during this summer. After test week in the weight room, I cut back to two sessions a week, with four sessions devoted to track work, for four weeks prior to the deca. As a result, I was probably only well programmed for the running events and the javelin. Everything else would have been a roll of the dice. And that’s at least partly because I do not have a good place to practice jumps and shot/discus. In order to do this well, I’m going to have to solve this conundrum, which is specific to where I am (in other words, I haven’t had this problem in other places). Well, yes. I can. If I train correctly. I really just wanted to use that line from “Start Me Up,” which is one of the great double entendre songs. (And I wouldn’t be doing my day job if I didn’t connect it to EE Cummings’ poem “She Being Brand.” The song and the poem are in the same Hall of Fame.